DEICIDE have paid their dues long ago and have become so (in)famous that their fans will buy anything – even if it’s a subpar release, such as the horrendous Insineratehymn and In Torment in Hell albums. While the band made a huge comeback with The Stench of Redemption, they used up their good riffs on that release and promptly released the weak Till Death Do Us Part album soon thereafter. With furious blast beats and double bass in tow, speed and intensity are emphasized heavily throughout the album, and To Hell With God definitely proves naysayers and detractors wrong. Drummer Steve Asheim is the main songwriter now, and he shows that the Hoffman brothers aren’t missed at all. Asheim and Jack Owen have taken it upon themselves to write some old school riffs that DEICIDE fans have missed for so long. Since the addition of guitarist Ralph Santolla, DEICIDE has incorporated some amazing solos, opposed to the haphazard uninspired SLAYER whammy bar style that the Hoffman brothers favored so much. “Angels of Hell” shows off exactly how Santolla likes to shred, and his style fits DEICIDE much better than it does with OBITUARY. Benton has started a new habit of writing hilarious and long song titles, such as “Hang in Agony Until You’re Dead,” but fortunately, the music is fast, furious, catchy, and diabolical. With flashbacks of “When Satan Rules His World,” “Into the Darkness You Go” has a similar feel and pushes the intensity to the max. The closer, “How Can You Call Yourself a God” contains one of the most hilarious chorus lines ever written, but you’ll soon find yourself happily singing along to this line. After a lengthy legal battle with ex-members over the band name, GORGOROTH leader Infernus has unleashed Quantos Possunt Ad Satanitatem Trahunt by recruiting a few well known musicians for this project – vocalist Pest from back in the band, along with Frank Watkins (OBITUARY) and Tomas Asklund (ex-DISSECTION, DARK FUNERAL) to round out this super group of sorts. Immediately, the dry production of Quantos reminds the listener of DISSECTION‘s Reinkaos album, and a few of the same mundane beats used by Asklund are also featured on the opening track. While Pest’s vocals are quite tormenting and fit the black metal genre perfectly, the bland riffs and stale drumming turns off the listener to this hyped up album. The first few tracks show that the band has lost its edge and power of earlier GORGOROTH material, as witnessed on Antichrist and Pentagram. A song like “Rebirth” fits Asklund‘s simpler drumming style better and the band can actually write good, slow songs; something that MARDUK has failed to do. “Building A Man” kicks in with an older GORGOROTH feel, which finally brings some life to this album. That is until the next track, “New Breed” – which sounds like a b-side from the Reinkaos sessions. After a few uninspired tracks, Quantos builds some momentum, but it’s too little, too late. “Satan – Prometheus” becomes one of the best tracks on the album, as Asklund finally blasts like he used to with DARK FUNERAL, and Pest shows off his clean vocals, with a much better range than Gaahl. “Introibo ad Alatare Satanas“, a short outro, is an excellent song for all 53 seconds, but leaves the album ending abruptly. Death metal vets OBITUARY are readying to embark on a North American headlining tour in support of latest long player Darkest Day, released via Candlelight Records this past June. The tour will kick off on September 3rd at The Rock in Tucson, AZ and pillage its way through a month’s worth of shows before coming to a close on October 4th at Headliner’s Music Hall in Louisville, KY. The band will be joined by KRISIUN, GOATWHORE, THE BERZERKER, and WARBRINGER. 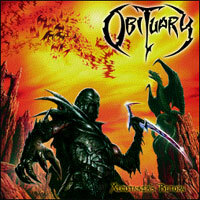 OBITUARY‘s forthcoming new album, Xecutioner’s Return, is set to hit North America August 28th via Candlelight Records. An exclusive iTunes-only advance single Evil Ways will be available July 31st. Tampa-based OBITUARY‘s current incarnation features original members, vocalist John Tardy, guitarist Trevor Peres, bassist Frank Watkins, drummer Donald Tardy and new guitarist Ralph Santolla (ex-DEICIDE, ex-DEATH). Album art for Xecutioner’s Return was created by artist Andreas Marshall. Marshall has worked with the band for The End Complete and their most recent record Frozen in Time. The album was produced by the band with mastering completed at Morrisound Studios in Tampa on June 16.Â View the album art here. 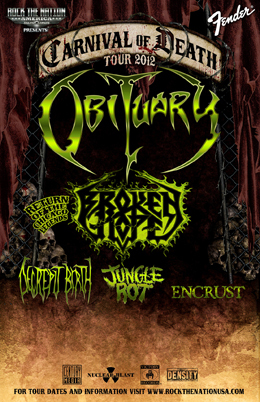 OBITUARY will embark on a headline tour of the US on September 11. Tour details will be announced shortly.